The releases that Privateer had this month was too much to contain in just one set of releases. So get ready for Privateer January Releases 2: Release Harder. You've got a new warcaster and warjack for the Protectorate. You've got the new Retribution colossal. You've got yourself the latest issue of No Quarter. 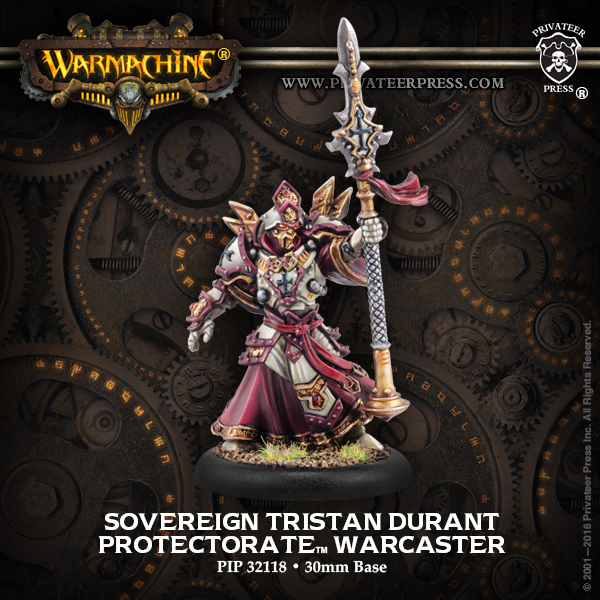 Since becoming a full-fledged warcaster®, Tristan Durant has been elevated to high station as a sovereign of the Protectorate. He serves the Creator by spreading the word of Menoth to all who would hear it. 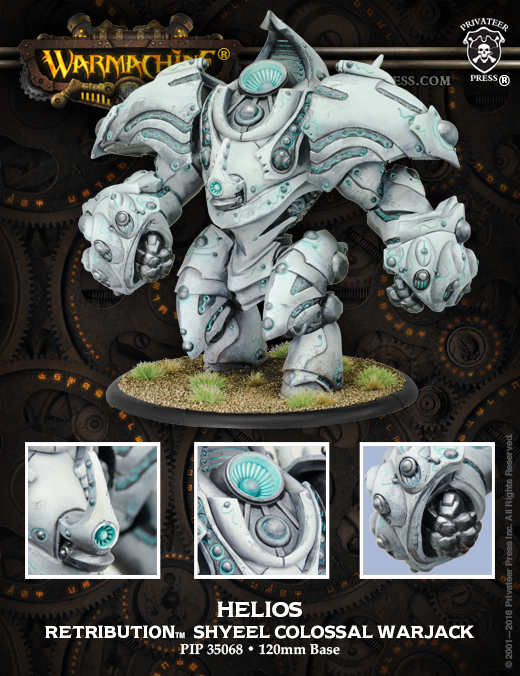 Though compassionate, Durant does not hesitate to unleash holy wrath in Menoth’s name upon his enemies, particularly when such foes threaten the safety of the growing flock under his protection. 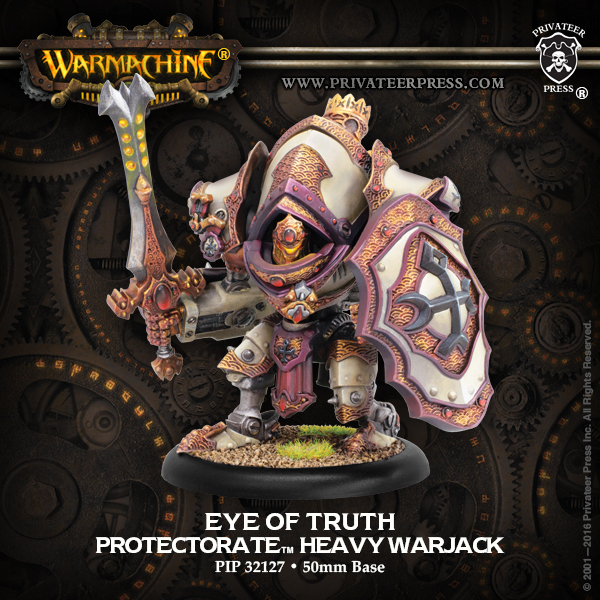 Resplendent with the glory of Menoth, the Eye of Truth banishes the foul sorceries of unbelievers with the might of divine will. When this magnificent warjack® fights, there is no place for the wicked and unrepentant to hide, and their perfidies are soon cleansed from the world. The Eye of Truth has transcended its humble origins as a simple weapon of war to become a true instrument of the Great Crusade. The Hyperion towers over the vanguard as one of the most formidable weapons in the Retribution’s arsenal, armed with an incomprehensibly powerful starburst weapon capable of annihilating anything in its blast. The Helios, housing the largest field generator in any myrmidon, has the power to reshape battlefields; the monumental forces it wields push and pull opponents wherever it chooses. Originally kept within Ios’ borders to defend the nation and especially House Shyeel, these machines have recently been added to the Retribution’s righteous cause. 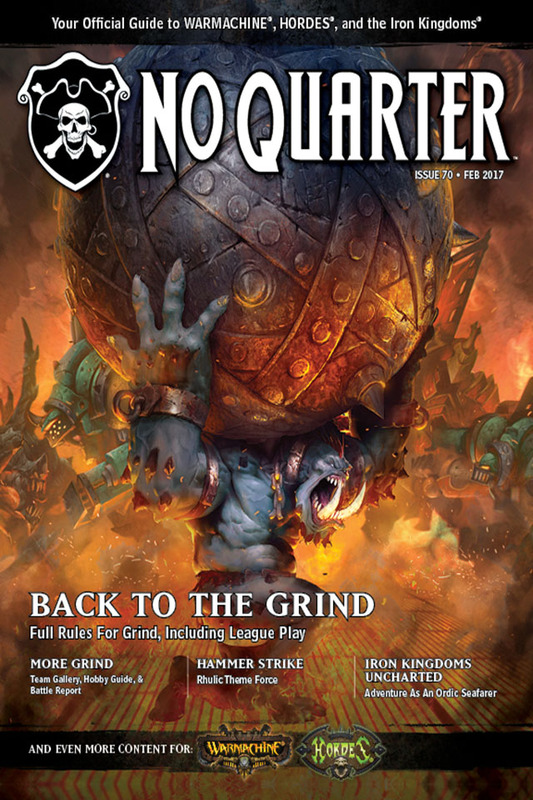 No Quarter #70 makes its way downfield with a winning roster of new content. Featuring the new edition of Grind™, this issue provides you with all the rules you need to bring your favorite warjacks and warbeasts back to the Destructodome. Want to read about the gameplay in an exhibition match? We got your covered with a Grind battle report. Wondering how we made our Grind arena? Our extended Grind edition of Modeling & Painting provides all the knowledge you need to build your own board. All this, plus a new Tournament Triple Threat on Cygnar, a Gavyn Kyle File on Tanith, the next installment of “Iron Kingdoms Uncharted,” and so much more! Know your army. Know your enemy. No Quarter.